I’m on vacation. Remember my mentioning my loving parents in sunny Florida? Went on a drive down to Key West, a place I’ve wanted to go for a long time, not because of Ernest Hemingway’s stays there, or Tennessee Williams, but the romance of the place, the southernmost point in the continental United States, a place where one is closer to Havana than they are to Miami (106 to 127 miles). While there I had an excellent mojito at the Mad Rooster, down the street from Sloppy Joe’s. And later I tasted a fantastic daiquiri made with Flor de Caña at the Rum Barrel, who boast an impressive collection of over 100 different rums from around the world. Even though I ordered the 7 year old, the friendly waitress said upon delivery of my drink, “The bartender sends his compliments, the 12 year instead.” What a treat! After returning with a warm glow of the fond experiences of the Keys, I felt another vacation drink was in order. Though I should make something Cuban, Brazil calls to me: Ice cold cachaça. A Caipirinha will refresh nicely in this summer heat. A word about cachaça – it could, maybe, if you put your imagination to it, resemble agricole-style rum. Cachaça is not distilled with molasses, but more directly from sugarcane juice. And why I say it could be compared to agricole is because of the flavor. A vegetal undertone prevails with every taste. Other than that, I either do not have the sense to describe with proper vocabulary, or cannot separate the number of flavors therein. I am a horrible reviewer for this very point. I can tell you however, I like cachaça not merely for a wondrous drink called the Caipirinha, but for all the different variations cachaça can flourish into by introducing any combination of flavors to it. For example, name any fruit, and it will likely taste perfectly balanced with cachaça. I realize it’s a bold statement, yet think it can back it all up. I want to tell you about the original, the straight to the point and most basic Caipirinha, and my favorite. 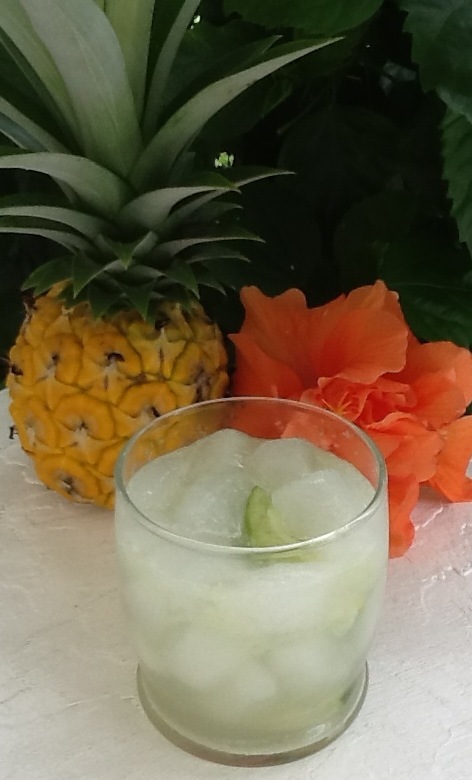 Even though I like pineapple more than any other fruit, if I had a choice I would prefer a straight Caipirinha. Muddle lime & sugar in mixing glass – get all the juice out. Fill old-fashioned glass with ice & toss into shaking tin (fill again to chill). Shake with cachaça & muddled lime until frost forms on tin. Pour untrained into chilled glass. Add more ice if desired. If you try a Caipirinha, or some cachaça, please do not think you are tasting a different kind of rum, whether or not you think the two spirits are the same or not. Cachaça will surprise you if you have not tasted it before. Take it as a warning, just as if you were about to drink orange juice when expecting apple juice. I hope you like it. I hope you like it and buy cachaça. I like rum first, yet will support cachaça, and root for it. How can I not when tasting the Caipirinha?